i think we have some good leads now people. Paintings with stormy waters, things refering to the battleship, the Fao Fortress near the sea. headphones being found across maps who give morse codes. they use morse in the form of light flashings. also, the ship is mentioned as a leviathan, read early in this thread that a leviathan is a mythical creature, just like the megalodon is. so it might be very well we are hunting a leviathan this time (Seeing Iraq is seen as ''east'' back in WW1) and we are getting all kinds of hints refering to things relating to leviathan like things. it HAS to do something with the waters around Fao Fortress, or atleast we van find new hints that will lead us in a better direction. People already hearing megalodon like sounds in the water of Fao Fortress when crashing their airplanes. my money's on a leviathan like creature we are going to find. Keep it up people! we are doing a hell of a job here, we might just have this stuff solved very soon! it get's refered to as mythical alot of times in different countries, seeing the history of eastern countries and their belives back then, they would most likely refer to it as mythical. but that aside, kraken/megalodon/giant squids/leviathans. in stories they get catagorized in the same way all together. The wikipedia article about Frederick Judd Waugh talks about him creating camo for US ships. According to the article only 1 ship got lost (now I don't know in what terms lost=lost or lost=destroyed) and then there is a (p. 154) wich I dont understand what is referring too. A page? Dono for now. "At that time she was repainted with the British-type "dazzle" camouflage scheme that she carried for the rest of the war. With the completion of that work, Leviathan began regular passages between the U.S. and Brest, France, delivering up to 14,000 persons on each trip. Once experience in embarking troops was gained 11,000 troops could board the ship in two hours. Before the armistice 11 November 1918 the ship transported over 119,000 fighting men"
and next the link between the theme tune and pirates of carribean= krakens hmmm? lol found a bug, if you have the headphones and listen to the morse code with your primary out as an elite class, it becomes unusable after the morse code finishes. I don't want to speculate anymore to throw people off topic so I'll end with this. The paintings on BB are related to Frederick Judd Waugh, who came up with ship camo, one of the ships being the USS Leviathan, and only one ship was lost... LOST. would be cool if you could record those noices, might be something? so maybe it actualy HAS something to do with a map which has a coastline where a new clue can be found. i like what you said about squad....has anyone tried collecting all sets of headphones in one map as a squad and then listening to morse??? also is it right to assume you do not permanently have these headsets only during the game/map being played? p. 154 refers to book: Havens, George R. (1969), Frederick J. Waugh: American Marine Painter. Orono ME; University of Maine Press. Maybe someone has it in their local library. 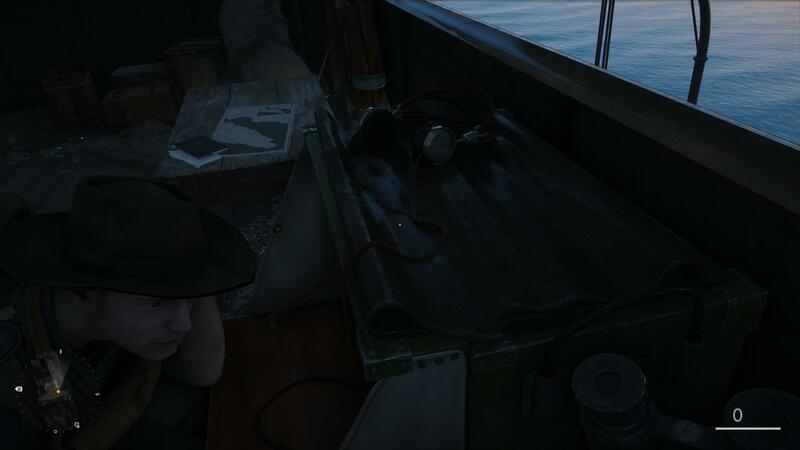 Maybe there's some details at page 154 of the "lost" ship. I love how people keep thinking about picking up multiple headphones, when its been said multiple times. There's 4 spawn location, 1 set will spawn at a random location. And can only be picked up once by one individual. Another won't spawn untill the server moves to the next map. You can not collect all 4, nor can an entire squad each pick one up. 1 person, 1 random spawn, 1 time per map. not the case so love it as much as you like laserlips...your mother was a snowblower! you muppet! :') look over at the map next to the dude with the headset on/book next to it. maybe there is some weird text noted down there or some words/letters/numbers on the notebook.